The NMLB will hold a regular board meeting in Albuquerque on Thursday April 25th, 2019 at 10:00 a.m.
Click the link below for tips on protecting your livestock and property. You can renew your brand, buy a brand book, pay for inspections, or pay a pharmaceutical invoice online using one of the buttons below. As part of the oldest law enforcement agency in the State of New Mexico, the men and women of the New Mexico Livestock Board serve and protect an industry that has been operating in the western territory of what is now the United States for over 400 years. Though New Mexico did not become a state until 1912, our agency was formed in 1887 as the Cattle Sanitary Board. The Sheep Sanitary Board formed two years later. The two organizations merged in 1967, becoming the New Mexico Livestock Board which continues today as an agency of the State of New Mexico. Our mission is to protect the integrity of New Mexico's livestock industry. Our team of about sixty full time inspectors and another sixty full and part time deputies continuously patrol and perform inspections around our state to help keep our livestock free from disease and safe from theft. We are also the office of the State Veterinarian, whose team collaborates with various government and private sector partners to ensure that our state remains free of diseases. Please notice our "What's New" link near the top of the menu on the left. This is where we post updates to emergent or changing animal health situations and other general updates. Notice also on that page a button to sign up for e-mail updates if you wish to receive occasional e-mail blasts as developments warrant. Try the search button in the upper right. For cattle import requirements, for example, try typing "cattle import". As with internet searches in general, follow the "less is more" rule. That is, type less in the search box to get more results. The menu choices to the left are broad categories. Choose the one that is likely to contain what you are looking for. For example, for cattle import requirements you would choose "Import / Export / Exhibition and go from there. Almost every page has a Page Menu which lists all of the section headings on that page. You can use that to jump to the section you need. See the Page Menu button centered in the green section straight above. When you get down below the left hand menu or if you are on a mobile device, an icon appears in the upper left to allow you to pull that menu down. To schedule a brand inspection, click "Personnel Directory" and click on the map where you need the inspection. Statutes and Rules are found under the main menu choice "Links and Documents." Use the link on the right to order brand books using your credit or debit card and we'll ship them to you. If you prefer to print out an order form and pay by check, click on the link below. 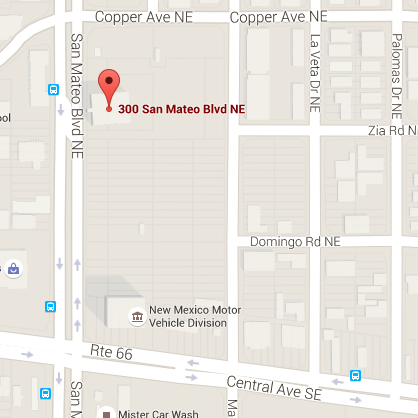 Our office is located on the NE corner of Central and San Mateo in Albuquerque, NM. We are on the 10th floor of the building located just north of the Bank of the West building. Parking is located off of San Mateo in between the two high rise buildings. Please take the elevator to the 9th floor and follow the stairs right up to our foyer. A small elevator is available, if needed, to reach our office on the 10th floor. Our office hours are Monday thru Friday 8:00am-4:30pm. We are open during the lunch hour. Click on the map below for more detail.